What I wanted to try this time were DOS front-end programs for BBS door games like Global War, Land of Devastation, and TradeWars. These front-ends work only in DOS, and each one is unique. They offer special features like EGA or SVGA graphics or sound effects. I’ll write more about these front-ends in the near future. Before I could do try using front-ends, first I had to learn how to telnet from a regular terminal program on an emulated PC. Turns out that it’s really easy. And the folks at StarBase 21 BBS have already written a great tutorial on how to do it. Basically, you don’t need anything except DOSBox! No socat. No tcpser. DOSBox has its own built-in routines for piping a telnet connection through its virtual serial port. 4b. Go to the “autoexec” section beginning on line 239 and add a mount instruction. This will tell DOSBox to use a folder on your computer as a hard drive for the emulated DOS PC. Save and close the config file after making this change. 5. On your computer, create that “dos” folder at the location you specified in step 4b. 6. Unzip the terminal program you downloaded in step 1 into the dos folder you created in step 5. 7. Run DOSBox. You should now be able to launch your terminal program! Be sure to change the baud rate to the highest available speed. Typing an “AT” style Hayes command in Telemate. Thanks for this! Brings back fond memories seeing Telix in action! Thanks to your notes, it runs well, and connects to an IP without any issues! Great tutorial, I’d love a tutorial like this to see if these old wardialers for DOS could be resurrected. 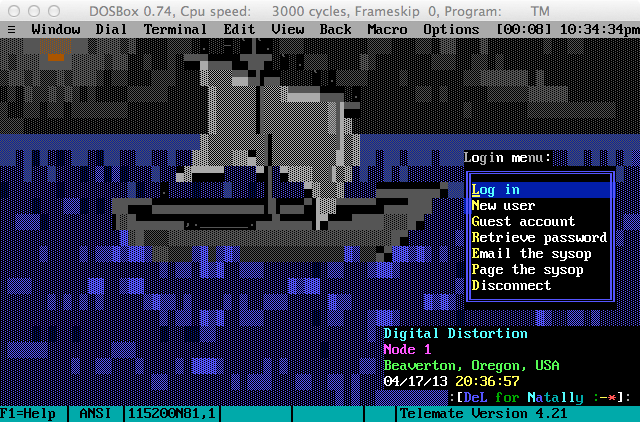 The programs operate but no way to virtually connect a modem into DOSBOX that I’m aware of.